Shiny new thermostat but can Hive best Nest in test? There are a lot of smart thermostats on the market and Hive is British Gas’ answer to Nest and plethora of others. Making a home a smart one can sound daunting but there can also be real financial benefits, especially where heating is involved. 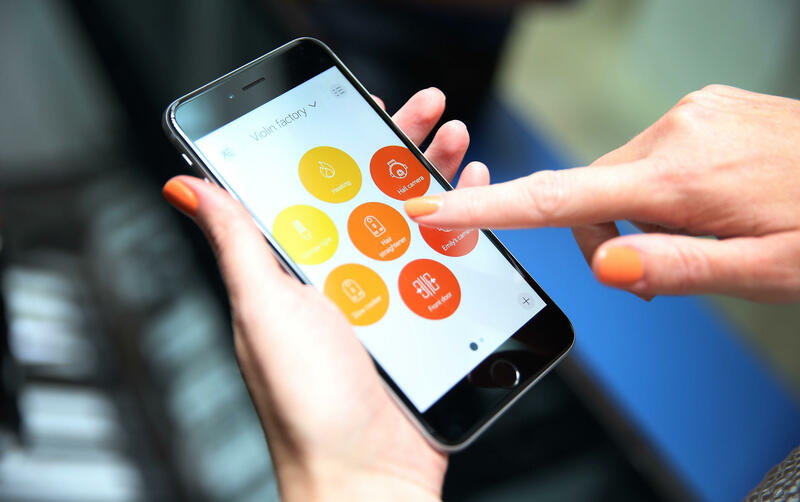 Hive promises to help in keeping energy bills down by allowing you to control the temperature of your home and adjust accordingly, wherever, whenever. It could be that you are on your way to the airport and you have neglected to turn down the heating. With the app, you can do just that and much more. The Hive Active Heating 2 is more of an evolution on its previous iteration than a revolution. However, the new thermostat certainly is chicer than the previous effort. It has a colourful interface that is much simpler than before. (you can upgrade to this for £99 if you have the original Hive). If you are buying new, Hive costs £249. This price includes the installation by a trained technician. That is the only price you have to pay. There are no ongoing costs and you don’t have to be a British Gas customer either. The system is compatible with most boilers but you may need to check before installation to make sure your boiler works with Hive. If you have one boiler, the installation will cover connecting to this and creating one heating zone. If you plan to separate your home into separate heating zones, then each additional zone will set you back £99 (This is known as Hive Multizone). The system comes with three devices. One is a wireless controller that connects to the boiler. There is also a hub attached by Ethernet to your router. Third is the thermostat. The system actually uses ZigBee to communicate among itself. The Hub sits between the thermostat and the internet so you can control it via an app. The hub and the controller need to be close enough to allow each to talk to the other. Otherwise, you will need a wireless booster to ensure good connectivity between the two. Installation was quick and easy. In fact, as we had previously tested another smart thermostat installation, ensuring the controller was properly connected to the boiler was very simple. The hub connects to the wireless router and when plugged in, will indicate whether or not it has successfully connected to the cloud. The hub and controller are very functional rather than stylish so hiding these away may seem like a good idea, but be careful that hiding them away also prevents adequate connectivity. The thermostat (which is a lot better looking) doesn’t need any cabling so can be placed anywhere. The thermostat is very easy to use. Just press the button and it will tell you the current temperature and the target temperature. The dial in the middle of the device will allow you to turn the heating up or down. There are also three other buttons (Menu, Done and Back). These will enable you to carry out other functions, such as setting a schedule. A button on the top can be used to boost the temperature and you can decide how long you want the heating to stay on for, regardless of whether or not you’ve reached the right temperature. The Hive app can also be used to control things and it is dead easy to use. It also features more ways to control heating. As well as this, the app can also be used to control other things around the house, such as lights and smart plugs. These will also show up on the app. Scheduling is best done via the app. You can specify when to heat your house and to what temperature. You can also specify different schedules for different days of the week. Copying schedules between days of the week are easy too. The app also sports a geo-location system which can work out if you have left home or are heading for it. It will then ask if you want to set the temperature lower or higher. There is also a holiday mode you can use to ensure that things tick over without using energy unnecessarily. As mentioned earlier, you can also control things other than heating with the app. Hive as a range of smart light bulbs, motion sensors and switches you can control with the app. These are simple to install. Just plug them into wherever you need them to be and then head over to the app and click on the Install Devices section. The app will ask if you want to Add a Heating Zone or Add Another Device. Add Another Device will search out for any devices you have plugged in. In our case, this took around a minute to complete. Devices have somewhat of a generic naming system but the app allows you to call them something more memorable. There are also recipes that you can use to make devices operate in certain circumstances. For example, you can have a light switch on if the motion detector senses movement. Important if you need to deter burglars. While all this is great, the smart devices cost money (a light switch costs £19) so it won’t be cheap. Hive also integrates with Alexa which means you can control heating with your voice. Adding in a Hive account to Alexa is pretty straightforward and within seconds we could literally tell Hive to switch the heating off. Hive is a great way to turn a home into a smart one. You can add as many or as little smart devices to it as you please. It would improve if you could integrate more third-party smart products into Hive. The advancements are significant enough to advise choosing Hive over rivals Nest and Tado. While alerts are great for asking you whether you want to change the temperature, we would like to see future updates allow automatic temperature control based on a user’s location.